The Cello Big Band (CBB) is a cello choir made up of any cellist associated with the festival (participants, guest artists, staff) interested in reading and performing works for many cellos, featuring contemporary arrangements and compositions, many of which have sections for improvisation. Let’s leave the norm..! We’ll learn a Crooked Tune and explore the different ways that make Crooked Tunes crooked! Then we’ll jam on the tune with backup rhythm and counter melody ideas. 9:00 AM Corbin Keep: Tricks, techniques and technologies of transcribing music from recordings. Director of this year’s Cello Big Band, Tom Culver, will guide us through some ideas on how to take improvised solos in this year’s CBB charts. 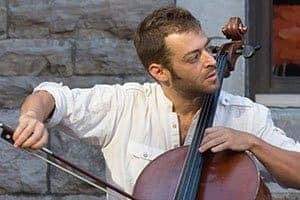 Several of this year’s guest artists and clinicians will participate in an open discussion, sharing their experiences and insights on how to be a well-rounded cellist and how to survive in today’s world as a musician. Sera will choose a silent movie and talk about improvising along with it. Everyone will have a chance to try their hand at this fun way to interact with images on the screen and create an improvised soundtrack. 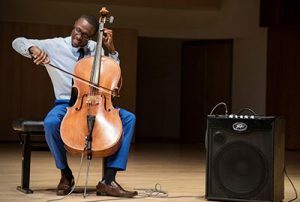 The New Directions Cello Festival is a performance and educational forum for non-classical cello, featuring performances, workshops, and jam sessions led by guest artists (and their groups) who are pioneering new directions for cellists in a wide variety of styles. Keep an eye on this website for the latest information. Also join our Facebook group. The festival runs from noon on Friday though 3pm on Sunday with workshops during the days, amazing performances on Friday and Saturday evenings (open to the public) with the guest artists and a free farewell concert (open to the public) by the Cello Big Band (open to all participants, staff and guest artists) on Sunday afternoon. 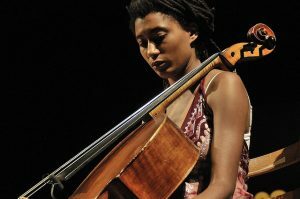 Chicago based cellist, composer and educator, Tomeka Reid has been described as “a remarkably versatile player” (Howard Reich, Chicago Tribune). Equally adept in classical and jazz contexts, Ms. Reid predominantly finds herself in experimental and improvisatory settings and composes for a wide range of instrumentation, from big band to chamber ensemble. Ms. Reid’s music combines her love for groove along with freer concepts. She is an integral part of Dee Alexander’s Evolution Ensemble, Nicole Mitchell’s Black Earth Ensemble/Strings, Mike Reed’s Loose Assembly, the Association for the Advancement of Creative Musicians (AACM) Great Black Music Ensemble. Reid co-leads the internationally recognized string trio Hear in Now with performances in Poland; Paris, Rome, Venice, Milan, Switzerland and in the US: Chicago, New York and Vermont. Ms. Reid also performs with many of today’s forward thinking musicians in the world of jazz and creative music including Anthony Braxton, George Lewis, Roscoe Mitchell, Jeb Bishop, Myra Melford, Fred Lonberg-Holm, Mary Halvorson, Denis Fournier, Edward Wilkerson and Harrison Bankhead. She also leads her own trio featuring guitarist Matt Schneider and bassist Josh Abrams and has contributed to numerous studio recordings. Gunther Tiedemann and Thomas Rueckert play their own music grounded in the jazz tradition with influences from traditional and contemporary music. Zachary Brown is a cellist, hailing from Brentwood NY. Born in Queens NY, Zach began cello at the age of thirteen. Now a college graduate, he studied at the Ithaca College School of Music. Zach has also been studying jazz in recent years, and has completed a degree in cello performance while concentrating in jazz studies. 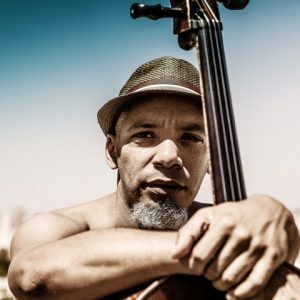 Zach has been cultivating a sound in jazz, bluegrass, blues and hip hop to bring a fresh, diversified sound in the cello world. 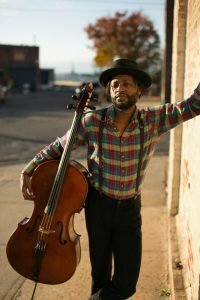 He is a two-time attendee of the Acoustic Music Seminar and the Savannah Music Festival under the tutelage of Mike Marshal and Julian Lage and taught a workshop at the New Directions Cello Festival on 2015. Zach is currently based out of Long Island where he is a fulltime teacher. Grant Flick, of Bowling Green, Ohio, has been playing and performing for the past seven years on many instruments including violin, mandolin, and tenor guitar. Primarily, his interests are jazz/swing, bluegrass, and new acoustic music. He has received numerous music awards including the 2013 Daniel Pearl Memorial Violin, and he was a 2015 finalist in the Walnut Valley Festival Fiddle Competition in Winfield, Kansas. He has been selected as a two-time participant (2015 and 2016) of the Acoustic Music Seminar held at the Savannah Music Festival in Savannah, Georgia. He has performed at the Grey Fox Bluegrass Festival, Red Wing Roots Festival, Indiana Fiddler’s Gathering, and many other festivals. Bass player Jacob Warren’s passion for acoustic music has led him to pursue a wide range of musical genres, from classical to Cajun, folk, jazz and more. He loves to blend these influences, and find the connections between different music styles. Intense collaboration and constant learning are some of the greatest joys Jacob has in music and in life. Matthew Davis is a young banjoist based in Nashville Tennessee. He writes and performs music ranging from bluegrass to jazz and even classical music. He is an alumnus of the Nebraska All State Jazz Band, and the winner of the 2016 National Banjo Contest. His goal is to make music that excites the audience, challenges himself and furthers the development of acoustic music. 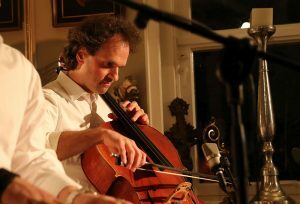 Jake Charkey is an acclaimed cellist with a strong background in both Western classical music and Hindustani music. He is also an eclectic improviser, drawing from eastern and western musical traditions, jazz, reggae, hip-hop, and his roving imagination. He is a sought-after studio recording artist in the film, television and music industry in both India and the USA. Jake completed his conservatory training at the Shepherd School of Music in Houston, TX. He studied Hindustani music in Toronto, L.A. and in India with Aruna Narayan, Jagan Ramamoorthy, Aashish Khan and Swapan Chaudury and is a disciple of the violin virtuoso Padmabushan Dr. N. Rajam in the rare Gayaki Ang style. In L.A., he completed his M.F.A. at Cal Arts in Hindustani music. During his time at school, he stretched himself musically, learning from avant-garde jazz innovators like Vinny Golia, Adam Rudolf, and Wadada Leo Smith as well as playing bass and cello with L.A. reggae and hip-hop bands. After grad school Jake moved to Montreal, where he founded a ten-piece klezmer orchestra, perfected his busking skills, and continued to perform Hindustani music, both as a soloist and accompanying Kathak dance. In 2010 he went to India with an arts fellowship from the Shastri Indo-Canadian Institute to support formal study under Padmabushan Dr. N. Rajam. Jake has performed and recorded with numerous artists in India, the U.S. and internationally. In 2015 he started Rose Productions with Veronica Simas de Souza, a music startup dedicated to building musical bridges between India and N. America.